I’ve been getting a lot of questions about my hair regimen lately and to be honest, I struggle with this question. Mostly because…I don’t really have one. I’ve been natural for about ten years. In that time I’ve watched countless vids, stalked multiple blogs and spent lord knows how many thousands of dollars on stuff in jars but at the end of the day, none of those things really made a difference. How you TREAT your hair, and by extension, your body, day in and day out has a far greater impact on the health of your hair than any product you can buy. In addition, I’ve found that hair growth is really about length retention and my hair does that best when I leave it alone. These are all pics of my hair taken in the past year. Sometimes it’s curlier, or kinkier or shrunken-i-er but it’s all mine. So let’s get the regimen part out of the way. PLEASE NOTE: None of these products are intended to ‘grow’ your hair, nor am I endorsing them as such. Also, I am vegan and I drink a lot of water. Internal nutrition makes a difference in the look and feel of your hair too. Not saying you have to go vegan to have nice hair, because that’s definitely not the case, but all these extra vitamins are definitely doing something. Co-Wash, Rinse or Oil Rinse (if I’m feeling fancy) 1-2x a week depending on the amount of exercise etc. I have very thick, coarse hair that is delicate while wet and tends to be more dry than oily, so washing too often can actually be detrimental. I also hate running around with wet hair, waiting for my hair to dry or using hair dryers. I haven’t used this line in a while but these guys are PERFECT for co-washing. They’re cheap, they smell great, and based on what I can find online, they’re vegan and cruelty-free. I’ll have to do more research into individual types though. Amla Oil, Jasmine Oil, Vatika Oil or plain coconut oil. Use a clarifying shampoo or treatment like the Aztec Indian Clay Treatment 1x per month to remove build up. I used to be really into this when I first became natural but I have fallen off big time. Nowadays I will stick to the Aztec Clay treatment or a hot oil treatment if my hair has the sads. What is that? I should probably trim more but I don’t. If you DO trim use very sharp scissors which are intended for and only used for hair. When I did trim, a long long time ago, I used this method. I’m a wash and go, low manipulation type of gal. Protective styling enabled me to stick with my transition years ago and I still do it 1x or 2x a year to give me and my hair a break. On the daily it’s either 1) out 2) in a puff 3) in a bun. Post wash and or rinsing of hair I wrap it in a men’s XXXL Tshirt because regular towels snag hair and frizz curls. They’re fine for your body, but micro-fiber or a t-shirt gives superior hair results. Once my hair is about 80% dry I section into 4-6 sections using clips and then start applying products. Here’s where there’s a fork in the road. Sometimes I apply a curl cream here followed by oil and sometimes I go straight to oil. I’ve noticed oil only has a much lesser chance of creating product boogers but sometimes gives a stiff result. And sometimes the curl cream will absorb but leaves me with a greasy to the touch finish. Whichever you decide, focus on the bottom half of your hair and especially the ends. I like to use a lighter oil or mix for the length, and then go back and do just the ends and edges with castor oil to create a protective barrier. Using oil or cream under gel protects the hair, seals in moisture, keeps it from drying down to a hard, stiff finish and gives bouncier curls overall. Gel it up. I only apply gel every 7-10 days. In between, I sometimes use just a tiny bit on my ends or use it to finger curl droopy sections. I focus gel on the bottom half of my hair. It never hits the roots or my scalp. Keeping my roots relatively product free means less scalp build-up and more volume. Rake all the product through with fingers, then brush just the ends with my Felicia Leatherwood Detangling Brush. First-day hair will be stiffer and more defined. I like to hop in the shower the next day with my hair in a puff and let the steam soften the gel cast a bit. Gently finger comb section to redistribute product (water will reactivate what is already in your hair) then add curl cream or gel as needed to just the ends. Sometimes I use a detangling brush if a section got really mashed. Love, love, LOVE this stuff. Click the link above to go to the recipe. EcoStyler gives me firm hold that lasts. I don’t always love it and we fight sometimes but pound for pound it’s my favorite. Bonus points for being available in just about every drug store everywhere because I can’t pack an 80oz tub into a carry-on. So I love everything about this line and I’m definitely going to be trying more of their products. This cream is thick but doesn’t leave any stiffness or heaviness the way shea butter based creams tend to. Which is one of the reasons I also love using it to refresh my curls. This cream is heavy duty and a little goes a long way. I’ve tried gooping it on alone but it doesn’t offer enough hold for my wash and goes and it leaves a heavy almost waxy/greasy finish when used that way. I prefer it as a refresher to help seal my ends or sparingly during my wash and go process. I make a mix of shea butter and sweet almond oil with jasmine essential oil thrown in for scent that I used on my hair and body post-shower. I prefer natural oils over formulated lotions. You can easily make your own mixture based on oils you prefer. Other good ones include jojoba, avocado, and coconut. I use this on my edges and ends to seal and protect before using gel which is potentially drying. Castor oil has an almost waxy finish. You may notice, even just using it alone on wet hair, that your hair begins to wave up because of its reaction to water. In my experience, that reaction makes my ends a little curlier as well. I sleep on a satin pillowcase (I even travel with one) instead of tying up my hair. It’s been better for my face (less drying) and my ends (again, less drying). I don’t like to put a lot on my scalp but I looooooove scalp massages. Maybe 1x a week I use a mix of pumpkin oil (high-fat content), coconut oil and peppermint essential oil on my scalp, then massage with my Vitagoods Scalp Massaging Shampoo Brush. Pumpkin and coconut oil nourish the skin and strands while peppermint oil creates this amazing tingle that aids, along with the massage, in increasing blood flow to the scalp/ hair follicles. It also just feels really, really good. Don’t manipulate wet hair unless it’s completely loaded up with conditioner and under the flow of the water and even then be careful. Hair is at its most susceptible to damage while wet. Put anything that needs to get to your scalp in a dye bottle with a nozzle. That way you don’t have to part all the way through and the product gets where it needs to be. I use these for shampoo and for scalp oiling. Don’t be obsessed with 100% tangle free hair. If you have hair like mine, it ain’t gonna happen and you’ll drive yourself nuts. Not to mention all the mechanical damage you can inflict repeatedly combing your hair. In my opinion, fingers are your best tools and combs/brushes should be back up. KEEP IT SIMPLE. Don’t run out and buy everything I mentioned just because I use it. Look at HOW I use it instead. You may already have similar products in your cabinet that you love and could sub in. 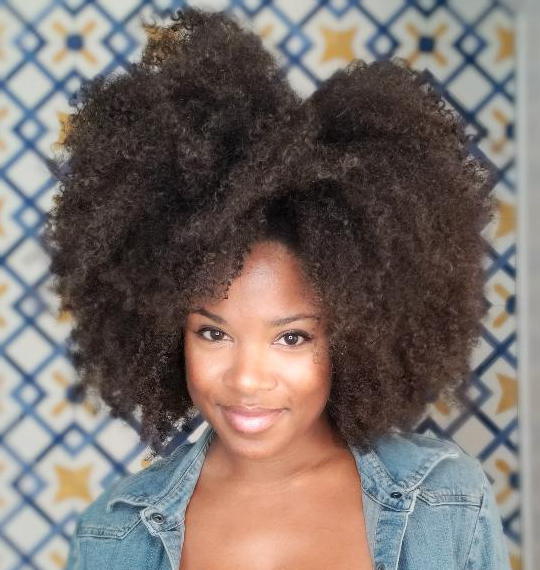 Always use seamless brushes and combs on your hair. If you have long nails or nail art that snags, wear gloves with applying products. Get acquainted with your hair. My hair is not your hair, is not her hair and so on and so forth. Give your hair time to show you who it is so the two of you can work together versus you trying to force it to be something else. Both of you will be happier in the long run (yes, I talk about my hair like it has a personality).